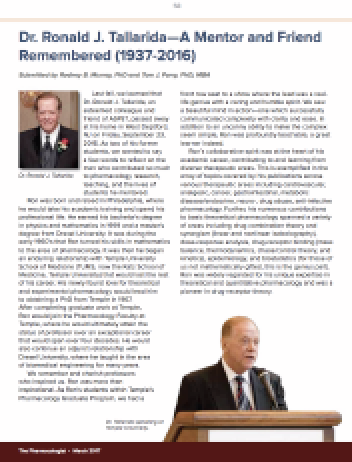 Dr. Tallarida was widely regaled for his unique expertise in theoretical and quantitative pharmacology – and beloved by scores of colleagues and former students. In addition to teaching cardiovascular pharmacology, pharmacokinetics, and drug-receptor theory to medical, dental, and podiatry students, Dr. Tallarida was a senior investigator in Temple's Center for Substance Abuse Research and co-director of its core on integrative pharmacology. His work, which has been applied to studies of blood vessel contractility, opioid receptors, and drug interactions, is represented in more than 250 articles and eight textbooks. He also holds three U.S. patents. His research interests involved combination studies of opioids as well as the drugs of abuse. In addition, he was interested in synergistic interactions between vasoconstructors. His work involved statisical analysis, experimental design and modeling. Interactions between opioids were measured in behavorial mouse models.